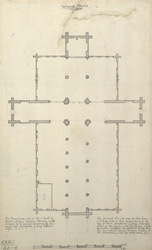 This plan is of the medieval parish church of Yarmouth, dedicated to St Nicholas, the patron saint of sailors. It was founded in AD1101 by Herbert de Losinga, Bishop of Norwich. The building itself dates from the 12th and 13th centuries. It has the distinction of being the largest parish church in England. Daniel Defoe noted that the "old church, is very large, and has a high spire, which is a useful seamark". By the 18th century, the church was in bad repair.